None of the Band's previous work gave much of a clue about how they would sound when they released their first album in July 1968. As it was, Music from Big Pink came as a surprise. At first blush, the group seemed to affect the sound of a loose jam session, alternating emphasis on different instruments, while the lead and harmony vocals passed back and forth as if the singers were making up their blend on the spot. In retrospect, especially as the lyrics sank in, the arrangements seemed far more considered and crafted to support a group of songs that took family, faith, and rural life as their subjects and proceeded to imbue their values with uncertainty. Some songs took on the theme of declining institutions less clearly than others, but the points were made musically as much as lyrically. Tenor Richard Manuel's haunting, lonely voice gave the album much of its frightening aspect, while Rick Danko's and Levon Helm's rough-hewn styles reinforced the songs' rustic fervor. 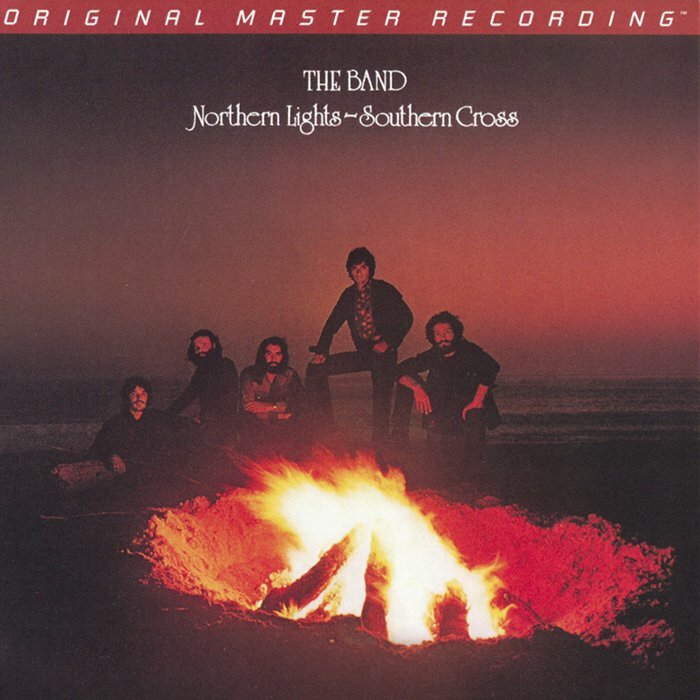 The dominant instrument was Garth Hudson's often icy and majestic organ, while Robbie Robertson's unusual guitar work further destabilized the sound. The result was an album that reflected the turmoil of the late '60s in a way that emphasized the tragedy inherent in the conflicts. Music from Big Pink came off as a shockingly divergent musical statement only a year after the ornate productions of Sgt. Pepper, and initially attracted attention because of the three songs Bob Dylan had either written or co-written. 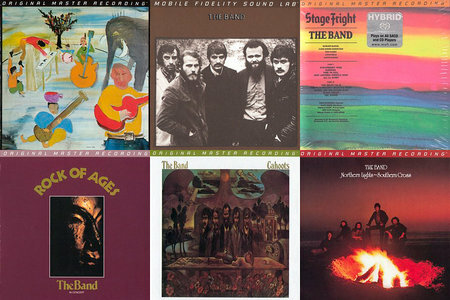 However, as soon as "The Weight" became a minor singles chart entry, the album and the group made their own impact, influencing a movement toward roots styles and country elements in rock. Over time, Music from Big Pink came to be regarded as a watershed work in the history of rock, one that introduced new tones and approaches to the constantly evolving genre. Mastered by Shawn R. Britton at Mobile Fidelity Sound Lab, Sebastopol, CA. 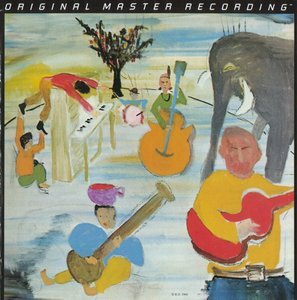 The Band's first album, Music from Big Pink, seemed to come out of nowhere, with its ramshackle musical blend and songs of rural tragedy. The Band, the group's second album, was a more deliberate and even more accomplished effort, partially because the players had become a more cohesive unit, and partially because guitarist Robbie Robertson had taken over the songwriting, writing or co-writing all 12 songs. Though a Canadian, Robertson focused on a series of American archetypes from the union worker in "King Harvest (Has Surely Come)" and the retired sailor in "Rockin' Chair" to, most famously, the Confederate Civil War observer Virgil Cane in "The Night They Drove Old Dixie Down." The album effectively mixed the kind of mournful songs that had dominated Music from Big Pink, here including "Whispering Pines" and "When You Awake" (both co-written by Richard Manuel), with rollicking uptempo numbers like "Rag Mama Rag" and "Up on Cripple Creek" (both sung by Levon Helm and released as singles, with "Up on Cripple Creek" making the Top 40). As had been true of the first album, it was The Band's sound that stood out the most, from Helm's (and occasionally Manuel's) propulsive drumming to Robertson's distinctive guitar fills and the endlessly inventive keyboard textures of Garth Hudson, all topped by the rough, expressive singing of Manuel, Helm, and Rick Danko that mixed leads with harmonies. The arrangements were simultaneously loose and assured, giving the songs a timeless appeal, while the lyrics continued to paint portraits of 19th century rural life (especially Southern life, as references to Tennessee and Virginia made clear), its sometimes less savory aspects treated with warmth and humor. 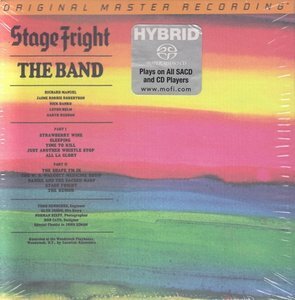 Stage Fright, the Band's third album, sounded on its surface like the group's first two releases, Music From Big Pink and The Band, employing the same dense arrangements, with their mixture of a deep bottom formed by drummer Levon Helm and bassist Rick Danko, penetrating guitar work by Robbie Robertson, and the varied keyboard work of pianist Richard Manuel and organist Garth Hudson, with Helm, Danko, and Manuel's vocals on top. But the songs this time around were far more personal, and, despite a nominal complacency, quite troubling. Only "All La Glory," Robertson's song about the birth of his daughter, was fully positive. "Strawberry Wine" and "Sleeping" were celebrations of indolence, while "Time to Kill," as its title implied, revealed boredom while claiming romantic contentment. Several of the album's later songs seemed to be metaphors for trouble the group was encountering, with "The W.S. Walcott Medicine Show" commenting on the falseness of show business, "Daniel and the Sacred Harp" worrying about a loss of integrity, and the title song talking about the pitfalls of fortune and fame. "The Shape I'm In" was perhaps the album's most blatant statement of panic. the Band was widely acclaimed after its first two albums; Stage Fright seemed to be the group's alarmed response, which made it their most nakedly confessional. It was certainly different from their previous work, which had tended toward story-songs set in earlier times, but it was hardly less compelling for that. 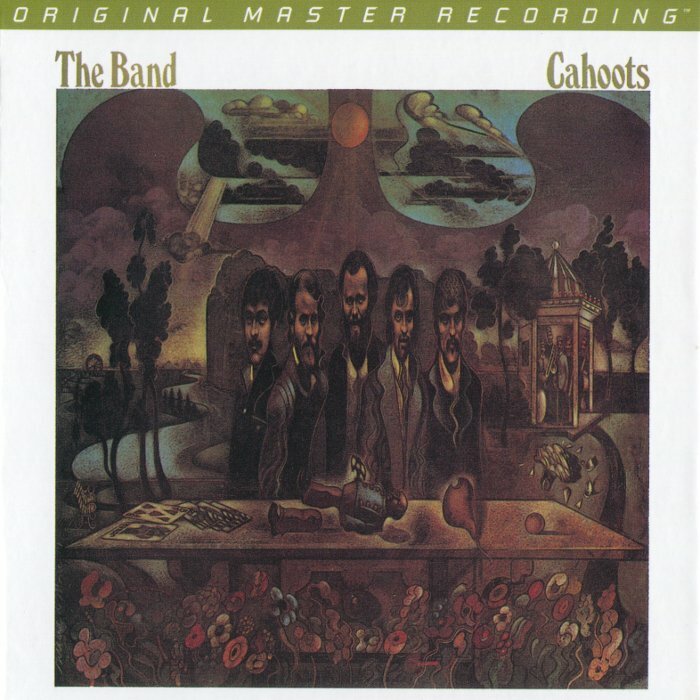 In comparison to its predecessors, Cahoots, the Band's fourth album, may be characterized as an essentially minor effort that nevertheless contains a few small pleasures. These pleasures begin with the leadoff track, "Life Is a Carnival," a song that continues the theme of Stage Fright by emphasizing the false nature of show business and its impact on reality. The song features a lively Dixieland horn chart courtesy of Allen Toussaint. "When I Paint My Masterpiece," a Bob Dylan song making its recorded debut here as the second selection, is another welcome track, buoyed by mandolin and accordion in a charming arrangement appropriate to its tale of an odd trip to Europe. "4% Pantomime" is a duet between the Band's Richard Manuel and Van Morrison that is entertaining to hear, even if the song itself is slight. Unfortunately, that just about completes the list of the album's attractions. Annotator Rob Bowman claims that the overriding theme of the songs is "extinction and the sadness that accompanies the passing of things that once were held to be of great value"; actually, there is no overriding theme to the minor songs written by Robbie Robertson. Several of the songs' lyrics come across as half-baked film scenarios, but they fail to be evocative, and they are paired to music lacking in structure. The failure is solely in the writing; the Band sounds as good as ever playing the songs, with singers Manuel, Levon Helm, and Rick Danko all performing effectively and primary instrumentalist Garth Hudson filling in the arrangements cleverly. It's just that the material is not strong enough, particularly in comparison to the three impressive albums the Band had released previously. 04. Where Do We Go From Here? DR13 -5.90 dB -20.82 dB 3:47 04-Where Do We Go From Here? Released on the heels of the stilted, static Cahoots, the double-album Rock of Ages occupies a curious yet important place in Band history. Recorded at a spectacular New Years Eve 1971 gig, the show and album were intended to be a farewell of sorts before the Band took an extended break in 1972, but it turned out to be a last hurrah in many different ways, closing the chapter on the first stage of their career, when they were among the biggest and most important rock & roll bands. That sense of importance had started to creep into their music, turning their studio albums after The Band into self-conscious affairs, and even the wildly acclaimed first two albums seemed to float out of time, existing in a sphere of their own and never having the kick of a rock & roll band. 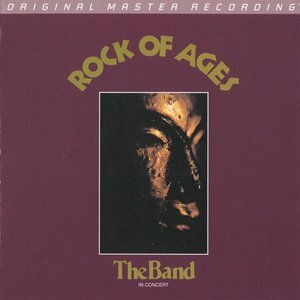 Rock of Ages has that kick in spades, and it captures that road warrior side of the band that was yet unheard on record. Since this band – or more accurately its leader, Robbie Robertson – was acutely aware of image and myth, this record didn't merely capture an everyday gig, it captured a spectacular, in retrospect almost a dry run for the legendary Last Waltz. New Orleans R&B legend Allen Toussaint was hired to write horn charts and conduct them, helping to open up the familiar tunes, which in turn helped turn this music into a warm, loose, big-hearted party. And that's what's so splendid about Rock of Ages: sure, the tightness of the Band as a performing unit is on display, but there's also a wild, rowdy heart pumping away in the backbeat of this music, something that the otherwise superb studio albums do not have. Simply put, this is a joy to hear, which may have been especially true after the dour, messy Cahoots, but even stripped of that context Rock of Ages has a spirit quite unlike any other Band album. 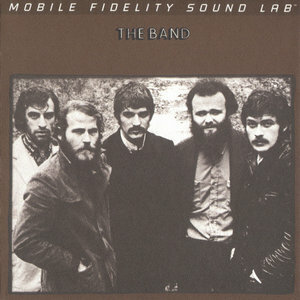 Indeed, it could be argued that it captured the spirit of the Band at the time in a way none of their other albums do. The first studio album of Band originals in four years, in many respects Northern Lights-Southern Cross was viewed as a comeback. It also can be seen as a swan song. The album was the Band's finest since their self-titled sophomore effort. Totaling eight songs in all, on this album the Band explores new timbres, utilizing for the first time 24 tracks and what was (then) new synthesizer technology. "Acadian Driftwood" stands out as one of Robertson's finest compositions, the equal to anything else the Band ever recorded. As a film, The Last Waltz was a triumph – one of the first (and still one of the few) rock concert documentaries that was directed by a filmmaker who understood both the look and the sound of rock & roll, and executed with enough technical craft to capture all the nooks and crannies of a great live show. 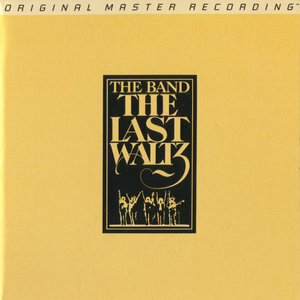 But as an album, The Last Waltz soundtrack had to compete with the Band's earlier live album, Rock of Ages, with which it bears a certain superficial resemblance – both found the group trying to create something grander than the standard-issue live double, and both featured the group beefed up by additional musicians. While Rock of Ages found the Band swinging along with the help of a horn section arranged by Allen Toussaint, The Last Waltz boasts a horn section (using Toussaint's earlier arrangements on a few cuts) and more than a baker's dozen guest stars, ranging from old cohorts Ronnie Hawkins and Bob Dylan to contemporaries Joni Mitchell, Neil Young, and Van Morrison. the Band are in fine if not exceptional form here; on most cuts, they don't sound quite as fiery as they did on Rock of Ages, though their performances are never less than expert, and the high points are dazzling, especially an impassioned version of "It Makes No Difference" and blazing readings of "Up on Cripple Creek" and "The Night They Drove Old Dixie Down" (Levon Helm has made no secret that he felt breaking up the Band was a bad idea, and here it sounds if he was determined to prove how much they still had to offer). Ultimately, it's the Band's "special guests" who really make this set stand out – Muddy Waters' ferocious version of "Mannish Boy" would have been a wonder from a man half his age, Van Morrison sounds positively joyous on "Caravan," Neil Young and Joni Mitchell do well for their Canadian brethren, and Bob Dylan's closing set finds him in admirably loose and rollicking form. (One question remains – what exactly is Neil Diamond doing here?) 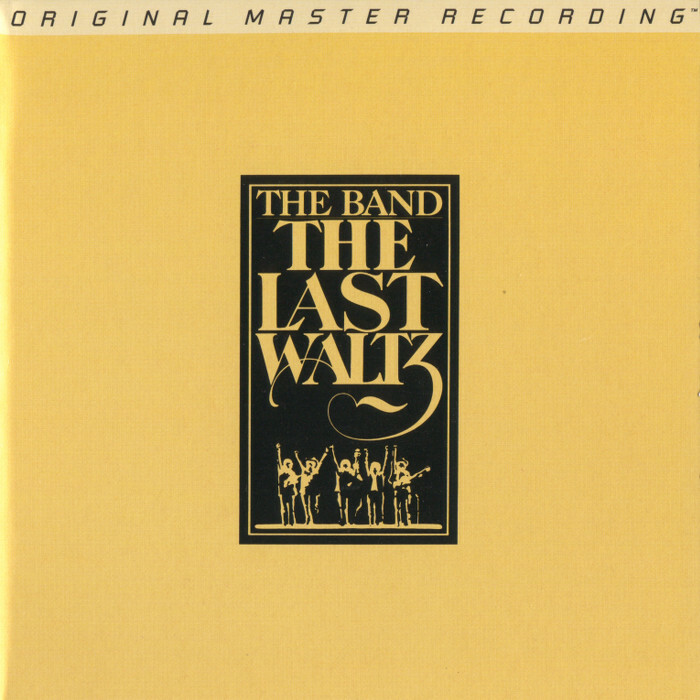 And while the closing studio-recorded "Last Waltz Suite" sounds like padding, the contributions from Emmylou Harris and the Staple Singers are beautiful indeed. Mastered bu Shawn R. Britton at Mobile Fidelity Sound Lab, Sebastopol, CA.